Upbeat Spiritual Living: What’s the Most Important Moment of Your Life? © 2016-2017 Kebba Buckley Button, MS, OM. World Rights Reserved. A pithy question: What is the most important moment of your life? If you knew which moment this was, wouldn’t you pay great attention to it? And would you possibly want to linger there? Here is the answer: It’s NOW. In Upbeat Spiritual Livingsm, we go for the best possible alignment among our mental and physical processes, our soul and our emotional ups and downs. Every day we make thousands of tiny and larger decisions about how to live. But do we know WHEN to live? Think about it. You can’t live in the future, because that hasn’t arrived yet. The future consists of outcomes we can only guess about, together with whatever we are cocreating with the Divine. But we can’t live there. We can’t live in the past either, although “living in the past” is a popular phrase. Many dwell on the past, some brooding deeply and analyzing endlessly, going over and over how they “coulda and shoulda and didna”. Many are keeping endless scorecards of those who did them wrong and what they should have said and done to exact a balance, if not revenge. Too many are having long conversations about how people treated them unfairly, with callous or even hateful intent. They “live in the past”. But all that has already happened, so there is little you can do about it without your time machine. And if we did all have time machines, we wouldn’t have time to live our actual current lives, because we would be so busy going back to see about that onetime boyfriend and tell off that abusive boss. So if we can’t live in the future or the past, where and when can we live? Only NOW. There is a precious moment immediately before you that is available for your consciousness and your choices. 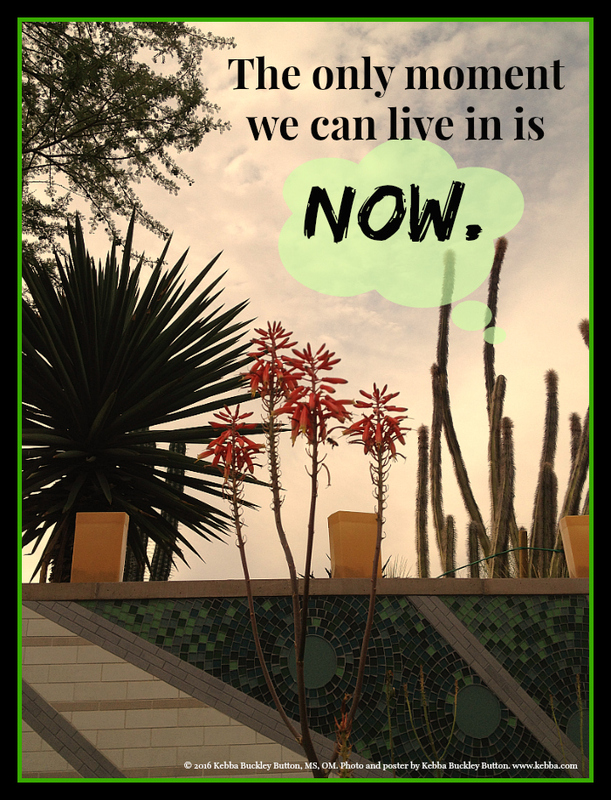 You can only live in this moment, this present moment, this now. And by the time you read THIS word, that NOW moment I just mentioned is gone. So truly, NOW is the only moment when we can actually live. I first saw this concept in an early book by the late Dr. Wayne Dyer, Your Erroneous Zones. He argued that you can’t be stressed if you concentrate on the here and now. In traffic, for example, he argued we should concentrate only on the cars, the trees, the sounds in and around the traffic. How can you obsess about your budget or your child’s health issue when you are firmly in the driver’s seat of your thoughts? This concept puts you in charge of your mind. So what would it be like if you stayed more in the NOW, not worrying about tomorrow? Try it for a day. When you find yourself sliding into worry about the past or future, simply exhale to your toes and come back to the present. You’ll be more relaxed and relating differently, with your loved ones, with God, and with your must-do lists. Let me know what shifts you notice. Keep practicing living in the present. And NOW you’re in Upbeat Spiritual Livingsm! ← Upbeat Spiritual Living: Can You Forgive Someone’s Hate? I have had lots of defining moments, and they help me sometimes, to remember what I have overcome, how I was strong or courageous or able to do it, whatever it was. In that way, living in the past can help. And today, my past (struggles with winter blues) helped me plan for the future today (by moving furniture that would both be closer to the windows & would feel more cozy/hygge) & helped me enjoy the moment, the now, because my son & I had funky music playing & I was truly thankful for how wonderful it felt to dance & sing all afternoon while we were getting everything done that we needed to do. It reinforced the power of music, movement & dance, specifically, and I will be trying to take that into winter with me, but it also felt completely wonderful as it was happening. Jeanine, so you had a power day! With respect to the past and a nod to the future you are cocreating with the Divine, you moved music and furniture in the Now. Btw, if you would ever like to share with me your experience of the winter blues and your solutions, I would be grateful; I’m planning at least one article on that. Blessings! Thanks!! Oh, neat! I’d love to and I have some posts planned (that I am writing now) on exactly that subject. This is perfect! So many look to the past or can’t wait for the future. Living new is perfect. Martha, Thanks! No moment like the one in which we can actually live. Thanks so much for visiting and commenting.